Scooter is an Appendix Horse (Running Quarter Horse) and my barrel racing prospect. 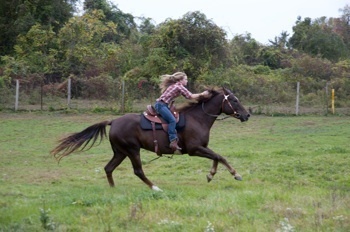 He was offered to me by my farrier to train for barrel racing to see if he has what it takes. I was given a great opportunity to have a horse that I could ride and train without having to buy him just yet. I wasn't really sure if I wanted to sell Zoey or not in fear of not being able to find another horse to train. My farrier saw more potential in me than Zoey and told me that I would do really well with training another horse that could take me further in barrel racing. After talking to my farrier when ever he would come out and trim the horses feet he offered me his horse Scooter. He told me that I could take him and start training him, if I liked him then I could buy him but if he didn't work out I could give him back. I was told that Scooter was a nice tall horse that was really smart and catty, which is a term used to describe horses who are quick, agile and almost catlike. I was really excited to see him and start training asap! I made a deal with my parents that I could get Scooter as long as if I had Zoey up for sale and was trying to get her a home before November or when we would have to start buying hay for the horses in the winter. Near the end of August my mom and I drove out and picked scooter up from my farrier's house. My farrier followed us home so he could help get Scooter settled in. He got along great with Jack, Zoey and surprising Jazzmine! Within a few weeks Scooter and Zoey officially bonded and became best herd mates! It was a shame that they bonded so well because I found Zoey a home on October 2, 2010, which meant that Scooter and Zoey couldn't be herd mates anymore. But it also meant that Scooter was here to stay! When I first rode Scooter he was a bit testy. He was green broke and only had a hand full of riding experience. This can be good and bad because it makes it easier to teach him new things since he is starting fresh but it also means that I must be very careful not to create any bad habits. Scooter had walked the pattern a couple times before I got him but not much other than that. Scooter was probably one of the best horses I had ridden in a while, even with him being green broke and not knowing much he was extremely responsive, listened as best he could and didn't through any fits. My farrier was right about him because right away I could tell how smart he really was. On October 15, 2010 I officially was the new owner of Scooter. I was very confident that he was destined for greatness as long as he was trained the right way. 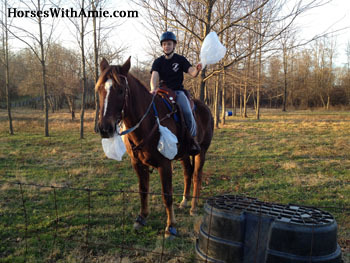 Read How to train a barrel horse to find out how I am training Scooter. Standing on Scooter with Spencer the pitbull and Bruno the boxer front and center. Living a fit and healthy life doesn't mean hours in the gym! 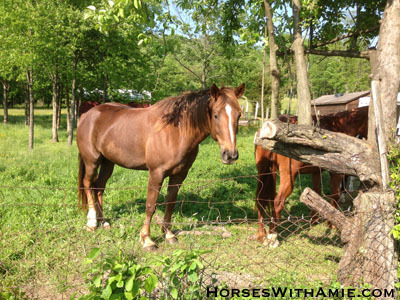 Spending time outside with your horses is a fun way to stay active. 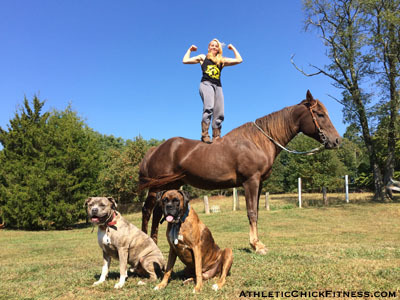 Check out my fitness website, Athletic Chick Fitness. Scooter relaxing in the field on a nice sunny day. 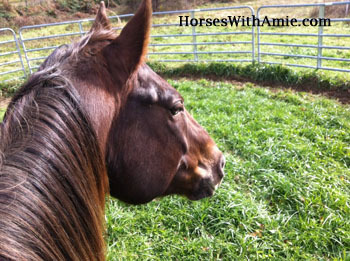 January 1st 2012 Update on Scooter!